This nightstand features a three-plug power outlet that allows you to plug in multiple items conveniently next to your bed. 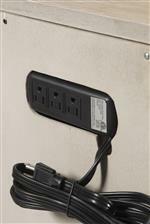 Use the outlets to power your lamp and alarm clock while also charging your phone or tablet as you sleep. The strip is located at the back of the nightstand, so that items can be easily plugged in while unsightly wires remain mostly hidden for a clutter-free bedroom. 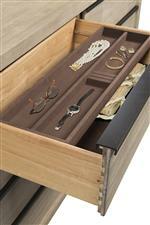 Drawers feature high quality European undermount drawer guides for smooth, reliable drawer function. These innovative guides provide an effortless pull, sturdy enough for heavy or frequent use in your home. The guides are also self-closing, so that with any light touch an open drawer will close quietly and completely, meaning no damage or loud noises from slammed drawers. 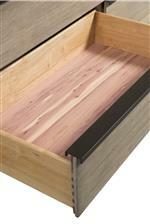 Drawers are constructed with English dovetail joinery, ensuring long-lasting strength and storage. 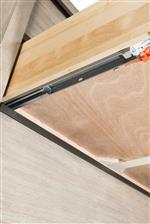 Made up of interlocking wedge-shaped elements called pins and tails, the joint connects drawer fronts, sides, and backs, designed to withstand the daily pulling forces you apply when you open a drawer, for problem-free use. A time-tested joint that predates written history, dovetail drawers are a mark of quality furniture construction. Keep all of your bedside essentials close at hand with this beautiful two drawer nightstand. 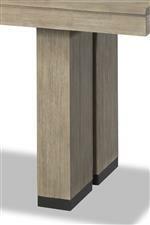 The piece is constructed from solid acacia wood in a wirebrushed greystone finish that adds a weathered look as well as a pleasing texture. Access the two spacious drawers via the oiled bronze, slimline fingertip pulls that also give the piece its contemporary look. Located on the back of the nightstand is a built-in power and USB outlet, so you can conveniently charge your devices overnight. The Larkspur 2 Drawer Nightstand with USB Port by Cresent Fine Furniture at AHFA in the area. Product availability may vary. Contact us for the most current availability on this product. This contemporary collection of bedroom and dining furniture is sure to make a stylish statement in your home. 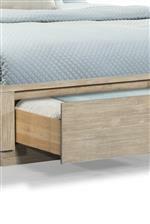 With each piece, you receive quality solid wood construction combined with more refined, modern designs, as well as functionality for the 21st century lifestyle. This beautiful collection is sure to create an atmosphere for your home that you'll love spending time in. 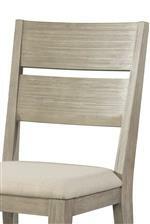 The Larkspur collection is a great option if you are looking for Contemporary furniture in the area. Browse other items in the Larkspur collection from AHFA in the area.